The relationship between a parent and a child is without any doubt one of the most influential and intimate relationships over the life course of an individual. Children resemble their parents in a variety of life outcomes such as socioeconomic status, family formation characteristics, and political views. There is growing evidence that some families – despite interventions by child protection services, judicial sanctions, and social mobility – are stuck in patterns of criminal behaviour, poverty, substance abuse, teenage parenthood, and other negative life events. This is a growing global problem for which currently no solution is available. 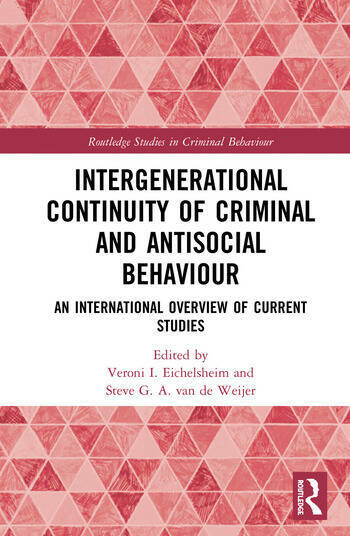 This book brings together the most important and unique findings of intergenerational studies of criminal behaviour from around the world, and from a variety of disciplines, from criminology to sociology to anthropology. Each chapter explores the historical background of a specific study, its most important objectives, and the unique conclusions and implications that can be drawn from the data. Essential reading for all those interested in criminal behaviour, psychological criminology, and intergenerational psychology, this book provides an extensive overview of intergenerational studies on patterns of continuity and discontinuity of criminal, antisocial, or delinquent behaviour, as well as related behaviours or risk factors such as the intergenerational continuities in (harsh) parenting and family relationship quality. Veroni I. Eichelsheim is a senior researcher at the Netherlands Institute for the Study of Crime and Law Enforcement (NSCR), Amsterdam, The Netherlands. Her research focuses on (intergenerational continuity in) the quality of family relationships, parenting, and delinquent behaviour – and the role of family interventions. Steve G. A. van de Weijer is a postdoctoral researcher at the Netherlands Institute for the Study of Crime and Law Enforcement, Amsterdam, The Netherlands (NSCR). His research focuses on life-course criminology, intergenerational transmission of crime, and genetic influences on criminal behaviour.